From pro-wrestler-turned-poet Cyrus Parker comes a poetic memoir that tells the tale of two relationships. 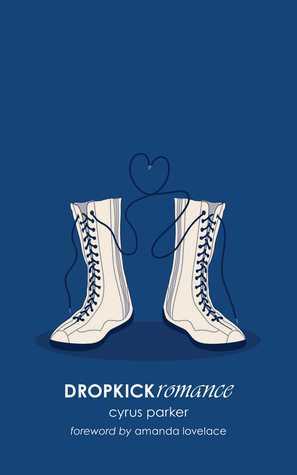 The first half of DROPKICKromance focuses on a toxic, long-distance relationship the author was involved in for several years, while the second half focuses on Parker's current relationship with poet Amanda Lovelace, "dropkick this broken heart and make it feel again." To ask other readers questions about DROPKICKromance, please sign up. This is a poetry debut I was highly anticipating and I wasn't disappointed. I don't really know how to rate and especially how to review modern poetry other than by gut feeling, and this collection/memoir was so honest and raw that I couldn't help but empathize with the author and what he went through. No matter who you are or what medium you use, it I was sent this book as an advanced copy by the publisher via NetGalley for reviewing purposes, but all opinions are my own. I don't really know how to rate and especially how to review modern poetry other than by gut feeling, and this collection/memoir was so honest and raw that I couldn't help but empathize with the author and what he went through. No matter who you are or what medium you use, it takes courage to open up as much as he did, especially when it comes to the first part of the collection. The story begins while the author is in an abusive relationship with a woman and through his poems he describes all the phases they went through and how he was constantly made to feel like he was not enough and he still hoped that everything would fix itself. He clang to the happy moments and the promises that this woman made, he kept forgiving her for the things she did and putting up a strong facade for the rest of the world while he worked as a pro wrestler. I also think at least part of the relationship (if not all) happened long-distance, and a few poems also touch on that aspect. After many years he finally managed to leave her for good, and as with all relationships ending his world was completely changed, plus he came to fully realize how much this woman had abused him and his feelings. 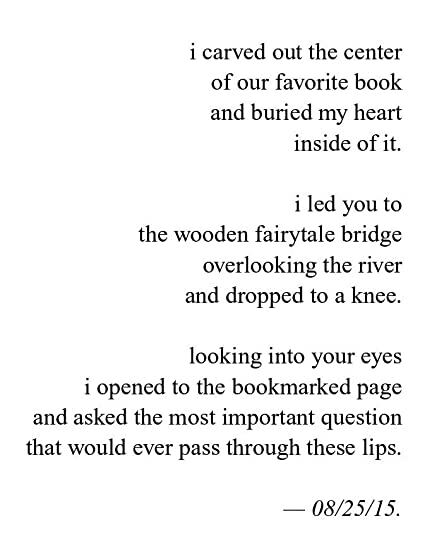 At some point during this fase, he met the now-poetess Amanda Lovelace and they fell in love, and the rest of the collection is about the initial part of their relationship. Reading this second part was cathartic because although it's by no means says that "love fixes everything", it does describe that, through a healthy relationship, they both managed to face their demons, together or on their own, but always supporting each other and being open about everything. Excellent first read of 2018. Of all the poetry I've read recently, and especially the poetry of this style, during this new "insta-poetry" movement, Parker's is the strongest. His use of language is profound; though this does very much feel like a debut collection, and Parker's voice and conflicts are those of a young man, he spins metaphors and similes alike with skill and ease. Many of his comparisons caught my breath as I thought, "How? How did he?" It helps that my favorite types of stories Excellent first read of 2018. Of all the poetry I've read recently, and especially the poetry of this style, during this new "insta-poetry" movement, Parker's is the strongest. His use of language is profound; though this does very much feel like a debut collection, and Parker's voice and conflicts are those of a young man, he spins metaphors and similes alike with skill and ease. Many of his comparisons caught my breath as I thought, "How? How did he?" Watch out Faudet-Leav, Lovelace and Parker will kick your butts. for what's on the inside. - how is this any less real? DROPKICKromance was surprisingly really good! Cyrus Parker has this raw and honest voice that will lure you in and will make you want to stay and just hear his words. This book exceeded my ex Watch out Faudet-Leav, Lovelace and Parker will kick your butts. DROPKICKromance was surprisingly really good! Cyrus Parker has this raw and honest voice that will lure you in and will make you want to stay and just hear his words. This book exceeded my expectations and although it's quite simplistic, there's just something that makes this book stand out from the rest of the books in its genre. Although the book does not have divisions that separated the themes of the poems like in The Last Time I'll Write About You, the contents flowed really well and were expertly sewn together the seams felt invisible. The poems present two relationships: one, that was toxic and abusive and the other, a respectful and fulfilling one. You can clearly see how the poems connected the past and the present feelings of the author and presented itself as this one, big journey of love and self-discovery. Amanda Lovelace and Cyrus Parker is definitely a team to be reckoned with. In my opinion, Michael Faudet and Lang Leav have nothing on this husband and wife team. They're both exceptionally good and produces unique pieces that will surely be a hit. i was in a long distance relationship for ten months and it was healthy, at all. similar to the first relationship in this book. 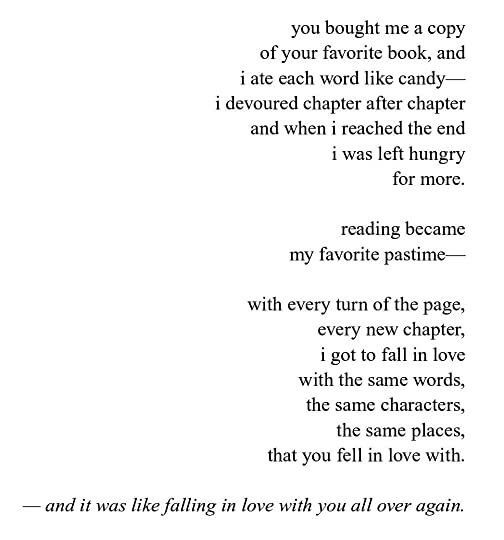 this hit all those feels and oh my gosh. i’m yet to find a love like the author did but i hope to one day. full review to come maybe?? There are a lot of highly successful male poets out there right now selling thousands of poetry books. They all have one thing in common: they write from the female perspective, for females. They tell us how we feel, what we need, what we're thinking...I am not a fan of this because I think they are profiting off of attempting to control our narrative while simultaneously romanticizing mental illness, "brokenness," and more times than not, they refer to us as "girls" instead of women (etc.) whic There are a lot of highly successful male poets out there right now selling thousands of poetry books. They all have one thing in common: they write from the female perspective, for females. They tell us how we feel, what we need, what we're thinking...I am not a fan of this because I think they are profiting off of attempting to control our narrative while simultaneously romanticizing mental illness, "brokenness," and more times than not, they refer to us as "girls" instead of women (etc.) which makes me feel like they are infantilizing us, in a way to establish dominance. There are so many talented women writers out there who can speak directly from their own unique experiences - why so many people are purchasing books with their hard earned money by dudes that speak in bland platitudes is beyond me. Just my opinion. That opinion is one of the reasons I respect Cryus Parker's work. Parker is not speaking for women, and I don't think he is writing in the hopes of garnering thousands of women fans. He's telling how two women changed HIS life (one for worse, one for better), not the other way around. Parker's book is not pages and pages of trying to read a woman's mind and put it down on paper. Parker is telling HIS story. And that was a welcomed change from what I have been seeing out there. I cannot explain how much I LOVED this poetry collection !!! I was reading it while in the waiting room at my doctor's office, trying to fight back tears. The tears won by the way, all these strangers were looking at me but I didn't care. Cyrus put so much emotion into his writing. You can feel all the pain and heartache he endures in the beginning. The first half of the book tells the story of an abusive long distance relationship. His words are beautiful and you could tell he put a lot of himself into this book. The second half of the book was about his wife Amanda, who is the Author of The Princess Saves herself in this one. Knowing this section was about her, made the connection I felt to the poems all the more powerful. Amanda wrote a the forward to the book and it was so touching. Cyrus and Amanda are such a loving and inspirational couple, they are also very nice people!! A wondrous look at two relationships through the use of poetry. I am so proud of Cyrus for all he's accomplished and am so honored to have gotten a peek into his life through the use of his beautifully crafted words that really spoke to me. 2017 was the year I discovered poetry, and in 2018 nothing seems to stop me from reading new poetry collections. 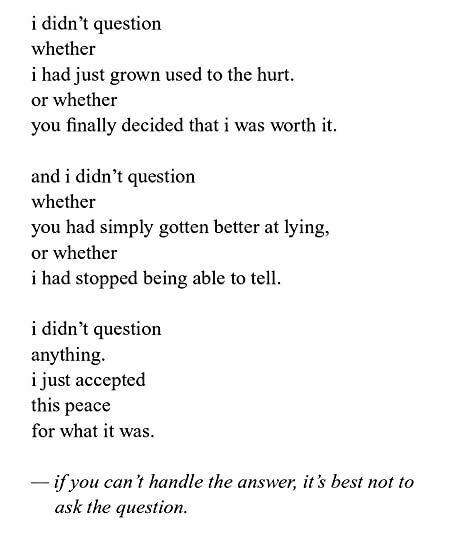 I discovered Cyrus' book only recently through Amanda Lovelace's Twitter, and ever since I only had one thought: read it. So when I found out you could request a copy of it, I jumped on the occasion. The book starts with a few words written my Amanda, and she said something that followed me throughout my whole reading. She said “he is so talented a weaver of words that when he aches, you will ache, when he falls, you fall”. And that's exactly how I felt. You can feel every raw emotion when you read a poem, and it's not an easy task. This collection of poems is clearly divided into two parts: the before and the after Amanda. There is no particular need for anything to notice it. From poems about abuse and an unhealthy relationship, you go to poems about meeting Amanda and the beginning of a healthy relationship that allows him to start healing. Meeting Cyrus and witnessing the love he shares with his spouse Amanda made me experience the collection more intimately. I began tearing up from the first poem. The collection tenderly describes the end of a toxic relationship and the blossoming of a magical one. It honestly felt like a fairytale. Amanda was right when she stated that Cyrus was a "talented weaver of words...when he aches, you will ache." I ached. I ached indeed and it was so good. I received this as an ARC on Netgalley. I always try to read the poetry that is offered there because I like to support poets in many ways. I wasn't aware ahead of time that Cyrus Parker is married to Amanda Lovelace, author of "The Princess Saves Herself in This One." The styles are identical across both works, structurally and thematically. I wasn't a huge fan of that book or that style of poetry, but I know many other people are right now. This poet is culturally relevant and playing up to the I received this as an ARC on Netgalley. I always try to read the poetry that is offered there because I like to support poets in many ways. I cried. I cried so hard. This collection is so beautiful, just wow. I’m still crying over Cyrus’s beautiful words ugh!! this was pure magic. I’ve never felt my own experiences so vividly like I did in this collection. the words struck me deeply and brought up feelings that have been dormant for some time. each detail was purposeful and well planned. the formatting of each poem being on the left or right side of the page, depending who it was about, was my absolute favorite detail. the little nods to amanda lovelace’s work was cute and appreciated by me as a fan. Absolutely beautiful. The structure of how everything written has a purpose and really amplifies it, making it so the reader can really understand what type of emotions are on the page. from drowning in a dark sea of lost love to swimming with a mermaid filled with hope, honesty, and a love that will never sink, DROPKICKromance wrestles with heartbreak and will win you over with poems of self-discovery, healing, and the fairytale ending you've always wanted to read. I've been looking forward to this book, and I'm so glad I wasn't disappointed. This was one of the most beautiful poetry books I've read so far. The first part talks about his previous relationship with a woman. Which was an abusive and toxic relationship, from what I understood also a long distance relationship. Before moving to the bad parts of it, he talks about how he fell in love with this women. Then he moves on to how he realized it was toxic, how for some time he didn't care and finally h I've been looking forward to this book, and I'm so glad I wasn't disappointed. This was one of the most beautiful poetry books I've read so far. The second part talks about him meeting Amanda Lovelace, them falling in love and their general progress through relationship all the way to marriage. The second part, also, talks how he embraced himself and his demons, and how Amanda helped him through that journey and saved him. DROPKICKromance was one of my most anticipated books of 2018 and it really met my expectations! This poetry collection tells the story of a boy who endured a toxic relationship for way too long. It's hard to read because it's a story of heartbreak and it resonates. However, it also talks about healing, about learning to love and value yourself. Throughout his poems, Cyrus Parker presents a journey from a harmful relationship to a healthy one, from dishonesty and pain to trust and respect, from li DROPKICKromance was one of my most anticipated books of 2018 and it really met my expectations! This poetry collection tells the story of a boy who endured a toxic relationship for way too long. It's hard to read because it's a story of heartbreak and it resonates. However, it also talks about healing, about learning to love and value yourself. Throughout his poems, Cyrus Parker presents a journey from a harmful relationship to a healthy one, from dishonesty and pain to trust and respect, from lies and illusions to true, sincere love. The second part of the book is my favourite, of course, and I think that every fan of 'the princess saves herself in this one' will really appreciate reading it, because it tells the other side of the story that Lovelace writes in her book, and it's really beautiful. A beautiful poetry collection about love lost, and love found. I really liked that the second half of this is about the woman that wrote "The Princess Saves Herself in this One." I've read that poetry collection and just knowing the connection was really cool. Almost every page of this book had something beautiful written on it. I certainly enjoyed reading it. I received an early copy through NetGalley in exchange for an honest review. This was one of the best and most powerful debut poetry collections I've read. I loved the composition and how all the poems together told one story - I read the whole thing almost in one sitting because I was eager to know what happens next. The way Cyrus described every small detail of his two very different relationships was captivating, both the toxicity of the first relat I received an early copy through NetGalley in exchange for an honest review. I loved the composition and how all the poems together told one story - I read the whole thing almost in one sitting because I was eager to know what happens next. The way Cyrus described every small detail of his two very different relationships was captivating, both the toxicity of the first relationship, and the little, loving, everyday moments of the second. This is a wonderful collection of poems from one of my favorite people on Twitter. It has the ability to resonate with every reader, a talent that I so admire. It's in turns heartwrenching and heartwarming, and tells the other half of the love story from the bestselling poetry collection THE PRINCESS SAVES HERSELF IN THIS ONE. When this book releases in March, I highly, highly recommend you pick it up. It’s hard and feels strangely wrong to critique poetry. As a poet I know the personal and deep intricate soulful detail that go into a piece. I find it, then, quite twisted to “review” a poetry collection. This, though, I wanted to just write about a little. Cyrus Parker lets his tears and his heart fall onto page after page as he exorcises demons and finds solace. It’s a personal description of a journey, and brings a hope to it’s darkness. I wasn't such a fan of this work, I have started to realize that this kind of poetry isn't something that I "get." I could feel the honesty in the poems and I felt the overarching theme was clearly visible, but for me it didn't invoke any feelings. A lovely debut from an even lovelier human. Even knowing Cyrus as a friend, I had no idea what to expect diving into his debut collection of poetry. What I found was a flowing narrative that resonated with me deeply. With simple elegant language, he gave us a glimpse into the rise and fall of a toxic relationship, and of course the blossoming of his relationship with Amanda. Nods to The Princess Saves Herself in This One present throughout, but DROPKICKromance stands on its own. I think the most A lovely debut from an even lovelier human. I think the most compelling thing about this collection was how relatable it was. By that I do not mean that it was cliche. Rather, I think almost anyone who has been in love can find a piece of themselves and their relationships within its pages. This poetry collection felt alive. That is the best way I can think of describing it. It takes the reader through a really toxic relationship and the emotional baggage that comes with that. And then it takes you through a healthy relationship, a healing one. And it, in a similar way, breaks your heart and then puts it back together. Cyrus creates sympathy with his poetry. He paints very beautiful images with his words and reading it, I can see everything. It was beautiful and I can’t wait to see This poetry collection felt alive. That is the best way I can think of describing it. It takes the reader through a really toxic relationship and the emotional baggage that comes with that. And then it takes you through a healthy relationship, a healing one. 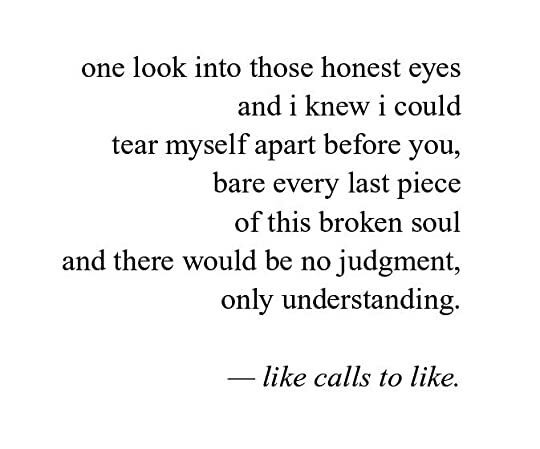 And it, in a similar way, breaks your heart and then puts it back together. Cyrus creates sympathy with his poetry. He paints very beautiful images with his words and reading it, I can see everything. It was beautiful and I can’t wait to see what he does next. This was such an wonderful collection and I really enjoyed it so much. Wow. This book contains more raw heart and soul than you can imagine. 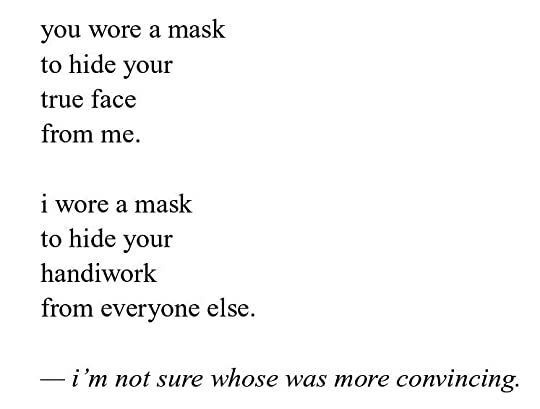 These poems were real and open and honest. I think Cyrus Parker definitely has a bright future as a poet, especially if he keeps it as real as he has so far. Lilting and beautiful poetry that is both sincere and relatable. cyrus parker is a pro-wrestler-turned-poet hailing from a small town in new jersey alongside wife and poetess amanda lovelace and their two ragdoll cats, macchiato and rosé. a self-described “big goth kid,” cyrus has an affinity for dark eyeshadow, dark clothes, enamel pins, and dropkicking the gender binary.